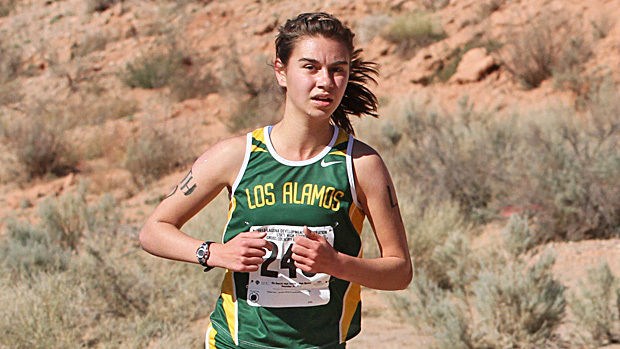 For the first time all season, Nica Vasquez was the face of the front for Los Alamos cross country. Photo by Alan Versaw. There were several top-tier teams that met up with a bitter end to otherwise spectacular NMAA-sanctioned seasons on Saturday. The Los Alamos girls were not among those teams. All the accumulated pressures and fatigue of life at the top were no match for the Los Alamos girls. Maybe that's why they are called Hilltoppers? Perhaps part of the magic owest to the fact that this is a team with no superstar. It is, rather, leadership by caucus. As Coach Kathy Hipwood reflected on Saturday evening, "Nica Vasquez became the sixth different lead runner for Los Alamos this season." When you have six different girls operating at that level, you have a very powerful program. And, further, you've probably done a very nice job of subduing the monster of selfishness. Los Alamos didn't take many first-place finishers during the season, but they were devastatingly effective at bringing their #7 runner in ahead of everyone else's 4 and 5. On Saturday, Katy Stockton was the last Hilltopper to cross the line at 20:17. Yet, Stockton beat the #5 from every other team in the field. She also beat the #4 from every team in the field save Albuquerque Academy. She beat the #3 girl from every team except AA and St. Pius. And, this is nothing unusual for Los Alamos. The only thing unusual about Saturday's showing was that it isn't always Stockton who is running in the #7 position for Los Alamos. There is an abundance of interchangeable parts on this team. Little wonder that Los Alamos is so difficult to beat. "We are very proud of these girls," Hipwood remarked. And all of Los Alamos should be. It didn't hurt that pretty much everyone who had sat out a meet at some time or another during the season was back in uniform and at least mostly healthy on Saturday. Coming in close on Vasquez's heels were names like Madison Foley, Talia Dreicer, Sophia Galvez, Amanda Mercer (last week's district winner), and Mikayla Pulliam. It's difficult to imagine all the ways you can get it done with a crew like that. Nobody need carry an excessive share of either the physical or psychological burden. So, what you saw on Saturday was a team that embodied a lot of what we talk about as the ideal in cross country. Los Alamos was a team that trusted their training and a team that trusted their teammates. In cross country, there are great convergences of individuals and great teams. Los Alamos is an example of the latter. And, that really was the show in the 4A girls race. It just wasn't all of the show. There was some pretty good entertainment to be found at the front of the race as well. Arena Lewis, who missed last year's state meet, set out on a mission to make up for lost opportunity. 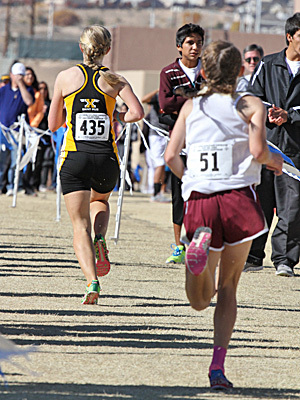 Lewis set a blazing early pace, and only Kelli Reagan of St. Pius dared to hang with Lewis. Through much of the first half of the race, it appeared that Lewis was on the verge of breaking Reagan and running unaccompanied to a state title. Yet, Reagan found the will to refuse to fold. Eventually, Lewis's unwithering pace did wither. And, Reagan made that her opportunity. Out on the west end of the course--where things get quiet and runners make decisions unabetted by the noise of the crowds--Reagan took control of the lead and never looked back, finishing in the best time of the day at 18:23 and eventually opening a margin of six seconds on her worthy challenger (photo, right, by Alan Versaw). And thus did Reagan complete her season undefeated in the ranks of 4A girls. Santa Teresa's Regina Marquez claimed third in 18:52. Following Los Alamos's 53 in the team standings were Albuquerque Academy with 67 and St. Pius X with 75. Nobody else came within 100 points of Los Alamos. Well done, Los Alamos! But I have one unanswered question remaining: What was the meaning of the candy-cane striping on the legs?